HDTV playback: If you do have an HDTV, you can set the camera to the appropriate playback. You’ll need an HDMI cable to connect the camera and television. You also need something called a Type C mini-pin HD cable; prices start at about $20. By default, the camera decides the proper video resolution to send to the TV after you connect the two devices. But you can set a specific resolution as well. To do so, select HDMI from the Setup menu, press OK, and then choose Output Resolution. For HDMI CEC TV sets: If your television is compatible with HDMI CEC, your D3100 enables you to use the buttons on the TV’s remote control to perform the functions of the OK button and Multi Selector during full-frame picture playback and slide shows. To make this feature work, you must enable it via the Setup menu. 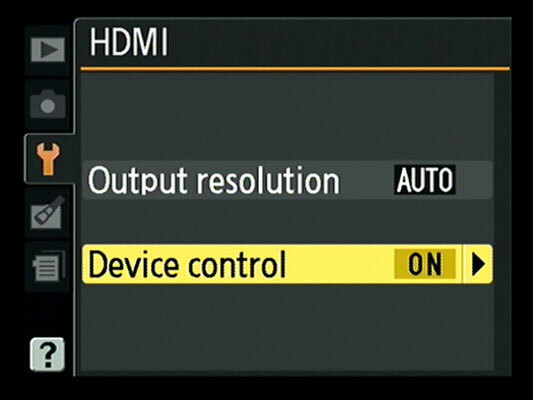 Again, start with the HDMI option, but this time select Device Control and set the option to On. Make one final check before connecting the camera and television: Verify the status of the Video Mode setting, located just above the HDMI option on the Setup menu. You have just two options: NTSC and PAL. Select the video mode used by your part of the world. (In the United States, Canada, and Mexico, NTSC is the standard.) The mode should have been set at the factory to the right option for the country in which you bought your camera, but it never hurts to check. After you select the necessary Setup menu options, grab your video cable, turn off the camera, and open the little rubber door on the left side of the camera. 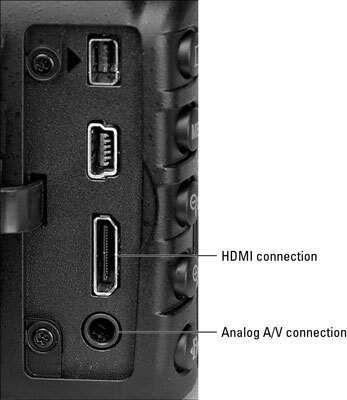 There you find two ports (connection slots): one for a standard audio/video (A/V) signal and one for the HDMI signal. The smaller plug on the A/V cable attaches to the camera. If you buy the Nikon cable, the yellow plug goes into your TV’s video jack, and the white one goes into your TV’s stereo audio jacks. For HDMI playback, a single plug goes to the TV. Refer to your TV manual to find out exactly which jacks to use to connect your camera. You also need to consult your manual to find out which channel to select for playback of signals from auxiliary input devices. Then just turn on your camera to send the signal to the TV set. If you don’t have the latest and greatest HDMI CEC capability (or lost your remote), control playback using the same techniques as you normally do to view pictures on your camera monitor.